The partnership between IWC Schaffhausen and Mercedes-AMG is 10 years old this year, and to celebrate, the Swiss luxury watchmaker has unveiled the new ‘AMG GT’ edition of its Ingenieur Automatic – the world’s first watch to have a case made of pure boron carbide – at the Goodwood Members’ Meeting. Limited to 25 pieces, the watch pays tribute to the Mercedes-AMG GT sports car, both in name and design. The multi-piece watch case is made from ceramic boron carbide – one of the hardest and most scratch-resistant materials known to man. 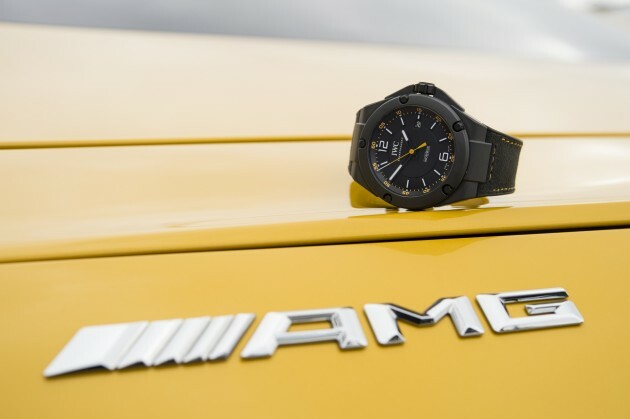 The black and yellow references the AMG-exclusive colour ‘solarbeam’, while the rubber strap features yellow lock stitch seams and a black inlay of Dinamica micro-fibre, as found on the steering wheel, seats and headlining of the Mercedes-AMG GT. This year, Goodwood saw former German racing driver Jochen Mass take to the circuit in the legendary 1971 AMG 300 SEL 6.8 while his Austrian colleague Karl Wendlinger piloted the new Mercedes-AMG GT. Current WEC world champion and former F1 driver Anthony Davidson also steered the Mercedes W04 F1 racer around the track. Will be sapu habis in very short time. Nope you are completely wrong. This watch uses an in house movement calibre 80110 made by IWC which based on the calibre 80000 family which can be found in the other IWC chronograph manufacture movements. It even uses IWC hallmark pellaton winding system which is similar to the one used in the infamous calibre 50000 movement with the 7 day power reserve function. The eta movement 2892-A2 you mention is nowhere remotely close in appearance to this movement. Please check your facts before you try to how lian on this site. Just because this is a car website doesn’t mean watch enthusiasts don’t read them. You are exactly right,i am a watch enthusiast just like you,for the record,you do know your facts on the technicalities of the specs.